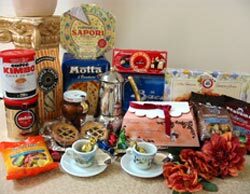 Our espresso gifts include a deluxe stovetop espresso pot, and espresso cups are showcased on a tray with cookies, espresso coffee and chocolates. As you can see, this gift can be customized to your taste and budget. Coffee pots are available in either 4 cups, 6 cups, 9 cups and 12 cups depending on style. Call us with your price range and we will help you choose.